Aww, another itty bitty sweater! Baby sweaters are so quick, yet so gratifying. first time doing a button band and buttons. The stripes are skinny enough that I just carried the colors up the sides, rather than cutting and having to weave in eleventy billion ends. 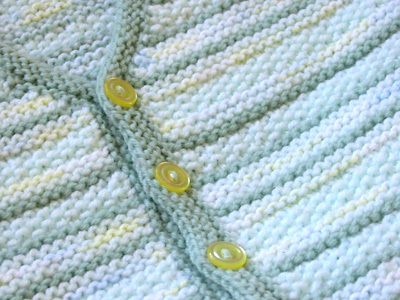 The buttons are knit on like beads, and then reinforced with thread. I also made a few modifications to the pattern. First, the pattern calls for rolled edges on the bottom and the sleeves. I opted for regular ol’ garter stitch to match the neck edging and button band. Second, the pattern calls for five colors; I pared that down to three to accommodate the yarn I already had. I do love the five-color version in the book, though; maybe I will knit one of those eventually. Recipient: TBD. There’s a wave of babies around here! Which is totally awesome for me, because I have no babies of my own to knit for. 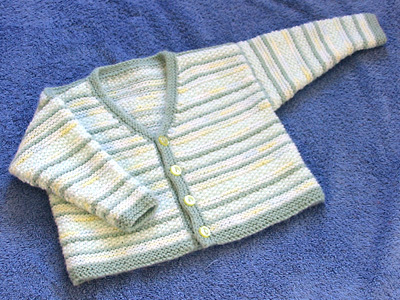 CogKnition posted this on March 11th, 2007 @ 10:49am in Baby Items, Finished Objects, Sweaters | Permalink to "Harvard Square Cardigan"
The sweater turned out so beautiful. I love the colours. I really dig the idea of buttons knit on like beads. I’m currently in button-band hell (sort of — I’ve banished that project for a bit) for the first time and would love to use this technique. Thank you!